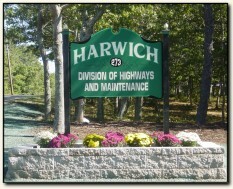 Through teamwork and interdepartmental cooperation, the Department of Public Works strives to provide the highest quality of public service to the residents, businesses, and visitors of Harwich, in the most cost-efficient manner. These services include snow and ice removal, storm water drainage, construction and maintenance of public roadways, solid waste management, maintenance of Town-owned parks, athletic fields, beaches, cemeteries, public buildings and grounds, as well as the planting and upkeep of the Town's public shade trees. Snow and Ice Policy adopted by the Board of Selectmen in 2006. Click the link below to view this year’s inspection report. Mailboxes located within road limits exist by sufferance only with the responsibility assumed by the owner. It is not possible for the Town to replace or repair any type of structure erected by an abutting land owner within the right-of-way that has been damaged as a result of highway maintenance or construction work. In the event of personal property damage, the Town of Harwich will only be responsible to repair or replace damaged property having been in actual contact with the snow removal equipment that is on private property and not within the public right-of-way.